rec. May-August 2008, ERMMedia studios, Virginia, USA. This odd and eclectic collection is by no means a single large musical experience. You will always want to listen to these pieces one at a time, nothing being gained by playing the disks straight through as at a concert. Recording quality is very good, average for today’s technology but not at today’s audiophile level. The quality of composition and performance varies widely, from magnificent to dreadful, and I have arranged the listing above approximately in that order. One’s appetite is not whetted by what is to my taste one of the ugliest and most unreadable record covers I have ever seen. Further, if you are not extremely careful, you can’t tell any difference between this disk and a different disk in the same series where the only distinction on the cover is hidden in the illegible display text. If you see the disk in stock and on display in a shop - an almost impossible experience these days, at least in the USA - take a careful look and check the issue number before buying. Let me begin at the bottom of my list. It is surely not fair to rate Mr. Gach’s composition Musician’s Wrestling dead last because most of the credit, or should I say discredit, goes to the conductor and orchestra who do not play well. The discordant bleating, stumbling, brass fanfares and ragged strings induce ear fatigue long before your first hearing is complete. Go ahead; it’s all right to hit the skip button. Checking the composer’s website, is like night and day. The beautiful performance of this work offered there on MP3 shows it to be enjoyable and very interesting. Buy the MP3 from the composer, don’t buy this CD recording for this work. The composer’s attaching a quotation from Emily Dickinson to the score does nothing to clarify it or explain, whatever insight into the creative process it may give. It’s not my musical idea of Emily Dickinson. Miller’s Kid’s Play, the second longest work on these disks, is made up of brief pieces, each including quotations from other symphonic music with virtually nothing of interest connecting them. Overall it sounds like just what it is, the score to a film about a day in the life of an elementary school student. Nothing bad goes on, but one hearing through is enough forever. I remember elementary school as an exhausting, dirty, frightening, challenging experience, more like Strauss’s Alpine Symphony, or Bartók’s Music for Strings, Percussion and Celesta. There was nothing cute or charming about being there and living it, the politically correct fantasies of parents and teachers notwithstanding. La Tristesse Durera, (“the sadness remains”), so entitled after a passage in a letter to Vincent Van Gogh from his brother, is a tonaphobic sonic essay. It’s typically fatiguing in the seemingly endless sequence of discords and lack of any perceivable dramatic intent or rhetorical motion. On his website Nigerian composer, conductor, and violinist Dr. Paul Konye is shown to be very busy with a number of activities at Siena College, New York, and other places in the world. A Tone Poem For Africa was composed and performed to commemorate the award of an honorary degree to Dr. Immaculee Ilibagiza, a survivor of the Rwanda genocide. While the circumstances of the work are interesting, the work itself is an occasional piece of little distinction. In the absence of any explanation in the notes, it appears to be an attempt to merge African folk music motifs with Western forms. Simple dance figures are repeated with slight variation by piano and strings. With more time and thought put to it this idea might have accomplished more. Ryan Vigil’s “Untitled” is a spooky, intriguing sound byte consisting of two electronic sounds, rain (or is it a locust attack?) and wind (or is it distant surf?) joined by high string chords. Gradually the pitch moves lower and is joined by various percussion accents. A British ambulance drives by. So far the title might be “February dawn in Brighton.” Then, after some more banging and throbbing it just runs out of steam and stops. A good beginning, but there’s much more work to be done. Varjot is a sonic collage built of simple, not very original units, that is to say, they remind you of other music. It goes its course without making much of a point. Rain Worthington is the only woman composer represented on these disks. Her Confluences for strings repeats simple ideas with slowly evolving changes seemingly forever. You’ll be glad when its over and surprised to see that it’s been less than seven minutes when it seemed like much longer. Philip Glass is able to create excitement, drama, and suspense by doing this; perhaps it is the rhythmically flat performance here that is mostly at fault. Encounter with a Jazz Riff pretty much says it all, with jazzy brasses dancing around Ivesian mysterious strings. Entertaining and accessibly tonal it is worth several hearings. The title of Shinji Eshima’s August 6th refers to the date in 1945 on which the first atomic bomb was dropped on Hiroshima, where the composer’s mother was born. He speaks of “expressing the unspeakable” a noble if unattainable ideal. A simple, very tonal, touching, ultimately unmemorable elegy for strings. Insomnia Music is an intriguing mood piece mostly for harp and strings after an introduction on motifs recycled rather directly from the Peter Grimes Interludes. Pleasant, worth hearing a number of times. R.A. Moulds’ Egloga: el Sauce que el enamoró de la caricia del Viento [The willow that fell in love with the wind] is a very lovely, totally tonal, idyll for strings and winds on the Dvořákian theme-and-repetitions-with-change-of-color format. Again, the performance on the composer’s website (the MP3 file, of course, not the MIDI version) is better than the one on this disk, but both are attractive and listenable, worth hearing many times. Jonathan Middleton’s Radiant Peaks is an intriguing sonic collage, including tape sounds. In its use of percussion and of rhythmic cycles it is reminiscent of Hovhaness. I think the orchestra needed a few more rehearsals but this is a work you will want to come back to a number of times. Robert A. Hagenbuch Jr’s Overture of Crisis and Ulf Grahn’s As Time Passes By are exotic works, basically tonal, which evince a genuine musical logical dramatic structure, something not much in evidence previously in our survey. Not only will you want to hear them over and over but you might want to find out what else these people wrote. Michael Karp’s Affirmation For Strings and Gary Sunden’s Vivace are the most conservative pieces on the disk. That they are thoroughly tonal in the classical style and thus thoroughly listenable goes without saying. But beyond that they are very good music. The Adornistos would tell us that writing tonal music in this time is lazy and cowardly, but I disagree. It takes a lot of courage and skill to write a piece of music that will be readily compared to the best of Mozart and Haydn - or in Sunden’s case, Rossini - where any shortage of inspiration or lack of craftsmanship will be instantly audible to the great majority of listeners. It’s easy to write a piece that sounds like Schoenberg when only a handful of people in the audience will have a clue whether it’s any good or not. 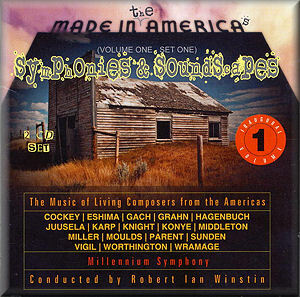 We come to the flagship work of this set, Jim Cockey’s Third Symphony “An Idaho Symphony.” Perhaps it isn’t fair to compare directly the previous brief orchestral essays with a fully worked out four movement symphony for large orchestra and I’m sure that many of the other composers on this disk have written more extensive and substantial music. But just as a diamond is, at 10 on the mohs scale, many times harder than sapphire is at step 9, the Cockey symphony towers mightily above the other music in this set. This work is the reason you need to buy this set. Landscape Symphonies have a long and honorable history and, by the way, I take any lengthy multi-movement work of serious intent to be a “symphony.” If we start with Vivaldi’s Four Seasons, and continue through Beethoven’s Pastorale, Glazunov’s The Seasons, and if we allow seascapes as well so as to encompass Debussy’s La Mer and Vaughan Williams’ Sea Symphony, their number is remarkable. Incidentally, Vaughan Williams’ five odd-numbered symphonies are arguably all landscape symphonies, a topic for another time. Among American works we have Hanson’s Sea Symphony, Ives’ Three Places in New England, and, most notable, Hovhaness’s Symphony #2, Mysterious Mountain. Hovhaness’s other landscape symphonies — for example, #50, Mt. St. Helens, and #60, Appalachia — while remarkable among his output, have never achieved comparable popularity. And I have intentionally not mentioned Grofé’s Grand Canyon Suite. Stravinsky said, “Music by its very nature is incapable of expressing anything” (Quoted by Alex Ross in a recent New Yorker) and yet even Sacre du Printemps and the Firebird Suite can be described as landscape symphonies if the Disney animation artists have anything to say about it. Cockey’s Third Symphony is like Vaughan Williams’ Third in that he is writing about his own familiar countryside - rather than a fantasy or idealized landscape, as with Hovhaness and Beethoven. It is however unique in that it was written to be accompanied by projected photographs of Idaho landscapes. This Idaho Symphony was commissioned by Dr. Paul Collins, a chiropractor and senior member of the Boise Philharmonic Symphony Board, who also suggested the format of the work. The concert on April 18, 2008, containing the world premier was the farewell concert to be conducted by the dedicatee James Ogle who had been music director of the orchestra for 18 years. Ogle’s concert reading timed at 33.28, somewhat slower and more romantically phrased than Winstin’s yet at places I am grateful for Winstin’s rhythmic precision and incisive attack. The Millennium Symphony Orchestra plays beautifully in this work, better than anywhere else in this set, and since it was recorded in 24 bit sound, we may some day see this recording released in high resolution format. Jim Cockey was born in Baltimore, Maryland, but has spent most of his life in Idaho. He holds a degree in Musical Composition from the University of Oregon where he studied with Homer Keller and Hal Owen. Jim has worked with the Moody Blues and the Carson City Symphony; his First and Third Symphonies were premiered by the Boise Philharmonic Orchestra and his Second Symphony by the Billings, Montana, Symphony Orchestra. Jim’s brother Tim is the author of two series of popular crime novels. Vaughan Williams’ England was a place of gentle green hills, rain and fog, and rich, irrepressible vegetation nourished by the blood of thousands of years of heroes and their victims. There are other interesting similarities, particularly in the handling of the scherzo and the use of solo instruments against the orchestra, to say nothing of the round lyrical phrases, lush harmonies colorful orchestration, and effective evocation of mystery and tragedy as well as joy. Jim Cockey’s McCall, Idaho, is a small, now highly gentrified town on a lake surrounded by high mountains and lodgepole pine forests. It was the site of the filming of “Northwest Passage” in 1939, and later was used for practice bombing runs by the crew of the Enola Gay on their way to their rendezvous with history in the skies over Hiroshima. McCall is a very beautiful place where the natural four seasons proceed clearly in their sequence. New England has nothing on Idaho when it comes to Fall colors. The photographs were chosen from among those taken by Idaho photographer Glenn Oakley, and selecting the photographs proceeded parallel to the composition of the music. Like Sibelius’s symphonies, Cockey’s Symphony is about a place where nature rules without the consent of Man; the only living things portrayed in the photographs are a single very small deer and a number of birds. There are some fences, a distant ranch, a lonely stretch of road; several pictures were taken in an abandoned orchard. A Winter view with distant lonely picnic tables buried in the snow further suggests the insignificance of humans. Photographer Oakley shows Idaho to Idahoans at a time when we need to become aware of how little natural beauty is left and to begin intense efforts to save what remains. Hardly any more powerful statement to that effect than this symphony can be imagined. It is to be hoped that this symphony will one day be available on a DVD with the photographs included; they add to the music. However the music is a completely satisfactory listening experience, a masterpiece even in the absence of the photographs. Vivaldi began with Spring, Glazunov began with Winter, but Cockey begins with Autumn with a grand, round, memorable landscape theme which at once engages the listener and is developed in a classic sonata form movement. The opening picture is a lonely misty valley at sunrise with green trees just beginning to yellow, the music a sweeping theme of a Tchaikovskian balletic integrity, the swinging of your arm in a grand arc gesture. No better opening could be imagined; the emotional effect is riveting, overwhelming. The listener is enraptured, spellbound until the final bar. Cockey’s Autumn is joyous, his Winter tragic but ending in promise, his Spring delightful and energetic, his Summer beginning ominous with leaden heat, the smoke of distant fires, later coming alive in the flowing of rivers. What does the music sound like? It doesn’t take long, especially in the scherzo, to guess that Copland is one of Cockey’s favorite composers, his debts to Tchaikovsky, Brahms, Wagner, and Prokofiev — even Frank Martin — expressing themselves more subtly. There is no Mahler/Shostakovich anguished pessimism here; this is pure classic American optimism, the individual in solitary interaction with the vastness of Nature, as perhaps nowadays only found in Idaho. This work employs the largest orchestra Cockey has ever made use of and his skill at orchestration is exceptional. The colors change with assured drama, sonorities and textures leading logically into one another, the balances always maintained between the extremes of register and texture, the surprises always anticipated but refreshing none the less, all upon a rich base of solid four square counterpoint. Violinist Cockey’s orchestra sings and breathes like a living being. Heard at the premier between The Firebird and Ravel’s Pictures, this work felt comfortably among equals, and inspired the strongest, most sustained applause of the evening, or any evening in recent memory. At the composer’s website you can purchase this CD and also audition and purchase a CD of Symphonies 1 and 2.